n 1565, attempts to search for a northwest passage were being seriously considered. Humphrey Gilbert was one of the strongest proponents of such a project. Possibly in that same year, he began to prepare a pamphlet outlining the advantages of a northwest route. 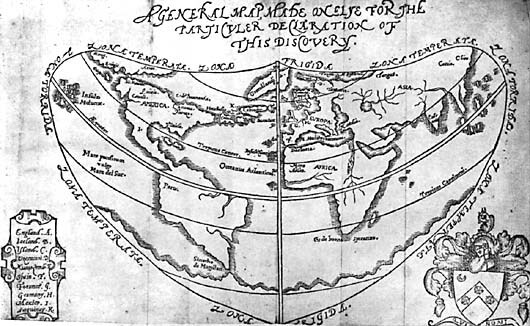 Called A Discourse of a Discoverie for a New Pasage to Cataia, its content was based on various geographical writings and maps, including those of Sebastian Cabot and Abraham Ortelius. In 1566, Humphrey Gilbert approached Queen Elizabeth with a proposal for a multi-year voyage to search for this new route to Asia. Gilbert and his backers sought the right to govern any newly discovered lands, on behalf of the Queen, and a monopoly on trade there. The Muscovy Company, however, objected to this proposal, believing they already held the rights to exploration in the northwest. Interest in the project faded and Gilbert turned to soldiering in the Queen's forces, in France, Ireland and the Netherlands; for this he was knighted (1570). Interest was revived, however, in 1574 when Michael Lok and Martin Frobisher began to plan their own voyage. Gilbert was brought into these discussions as an adviser. Publication, finally, of his Discourse in 1576 may have helped stimulate public interest in the Frobisher-Lok initiative. Gilbert himself turned his attentions to establishing a colony in North America. In 1578 he was granted a licence "to discover, take possession of, and govern any lands not already under the rule of a Christian Prince". His voyage enabled him to establish the first English colony on the northwest Atlantic coast (Newfoundland) in 1583. Unfortunately, he and his ship were lost at sea on the return voyage to England.